The Dolphin Nautilus robotic pool cleaner is lightweight and easy-to-use, has exceptional performance, all at an affordable price. It is perfect for in ground residential pools up to 50 feet in length. 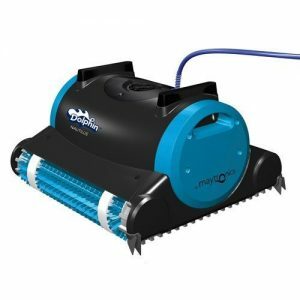 This robot does it all for a great price, from vacuuming the pool floor to cleaning and vacuuming the wall and cove area. The most noteworthy feature is the tangle resistant swivel cord. Because of this, you will spend less time de-tangling the power cord before using it each time. The dolphin is simple to use and requires no external hoses or booster pumps to operate. Furthermore, the unit comes complete with a single button, easy-to-use, power supply. It is more efficient to operate than a suction or pressure side booster pump driven cleaner. As a result of the main pool pump not running, you will save as much as 8x the operating cost of the pool pump resulting in a lower electric bill. The cleaner uses internal filters that accessible through the bottom of the cleaner and are easy to remove, clean and install. To maintain the filters just remove, rinse with the spray of a garden hose and re install into the cleaner. The cleaner has a variety of optional add-ons that can be purchased separately including replacement cartridges (Ultra fine and standard), a portable storage cart with cord & power supply holder and weather resistant storage cart cover. Have you pool looking great in just 3 hours. Includes a patented swivel cable to help prevent cord tangling. Plug-n-play! No pre-installation needed, no connections to pool system. Just drop and go. 12 month warranty – spare parts and labor.